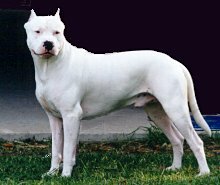 Argentine Dogo also known as the Dogo Argentino is a large dog breed. It is white in color and quite a muscular dog. This breed was developed in the Argentina with big game hunting in mind, the Argentine Dogo is used for hunting cougars and wild boar. This dog breed was developed in the 1920's & 1930's by Dr. Antonio Nores Martinez from a breed called Cordoban Fighting Dog. Although primarily developed for big game hunting this breed has been used for police and military work, it has also been used as a guard dog and a guide dog. The breed became famous for blood sport and thus gained negativity because of that. This breed was banned in the United Kingdom in 1991 and also is banned in Australia, New Zealand, Norway, Ice Land, Romania, Ukrain and Singapore, it is also banned in several cities in the United States, because of its link to blood sports and it being considered a dangerous dog. Although a tough dog, free of most dog diseases, this breed is known to be prone to pigment related deafness, Hip Displasia is also a possibility in this breed.